size*: 28" 30" 32" 34" 36"
29 strand natural double woven wool blend cinch with wrapped nylon center and leather reinforced bars. Natural wool blend cord is double woven to prevent chafing and is designed for durability and strength. Cinch features 3” flat stainless steel buckles and 1” dees. Made in U.S.A.
WHAT'S THE CORRECT FIT OF A CINCH? The cinch is the lifeline that holds your saddle in place, which in turn, keeps you in a stable position during competition. Because there is so much pressure applied to the cinch, you should take the time to become familiar with the key points most viable when choosing the right cinch. First and foremost, you must use a cinch that is specifically designed with your horse's comfort in mind... forget about your own convenience! Choose a cinch type by taking into consideration what you will be doing with your horse. The D's should lay flat and clean against the horse's "sweet spot". Always match your cinch and latigo strap to ensure you have ample "give". The flexibility is a must in order to move with your horse as he flexes, stops or turns. It also allows for lung expansion and comfort. Do: Use a leather latigo strap with a neoprene/nylon cinch. 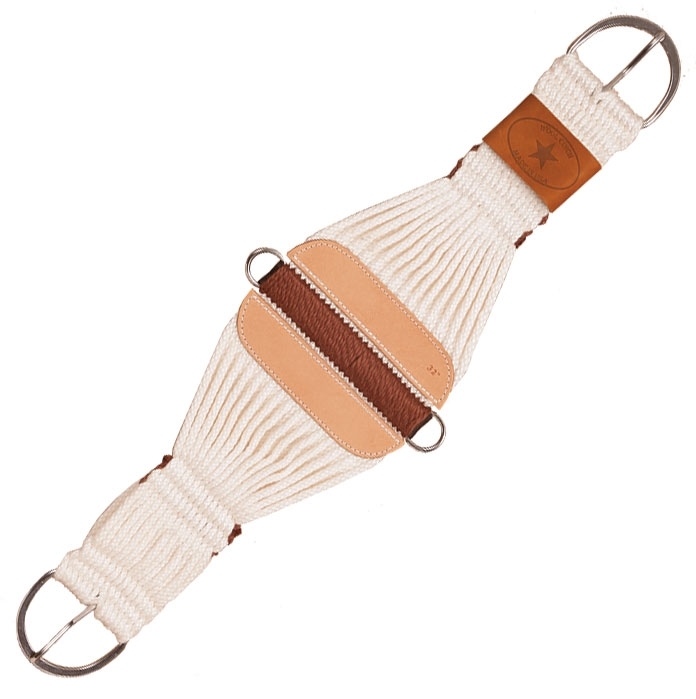 Use either a leather or nylon strap with a mohair & blended cinch. Don't: Use a nylon latigo strap with a neoprene/nylon cinch. This combination of materials does not allow "give".